Growing up, everyone seems to find their niche, the thing or friends that help them survive their tween years. In Jenny Rachel Weiner’s darkly funny comedy Horse Girls, an elite equestrian club comprised of twelve year olds experience the potential end of their life when the stable they so nearly and dearly love is potentially about to disappear on them. Horse Girls follows queen bee and president and decider of all Ashleigh and her entourage of “friends” as they embark in an eventful meeting of the Lady Jean Ladies. What begins as a normal meeting of hierarchy, jealousy, and all around cattiness on the part of President Ashleigh soon turns into an afternoon of chaos as news breaks that the Lady Jean stables may soon be sold, forcing the horses to be sold for, not glue, but meat. When a mutiny arises and the girls turn on their leader, Ashleigh does what any sensible twelve year old does, a reign of terror. Weiner’s script is everything you wish for in a tween-centric comedy. Weiner captures the hilarity and gravity of every little thing in a twelve year-old’s simple life. Her dialogue is sharp and witty. The dichotomy of characters Weiner presents in this tight circle of friends is quiet interesting. Rather than have similar clones, she mixes the privileged with the odd ball with the sidekick. With a very short running time, Weiner has much room to continue to develop this eclectic mix of girls so the supporting roles have a bit more of a cleaner arc. The meat is there, and quite nice, and by adding more, the abrupt climax of Shakespearean proportions doesn’t come across as rushed. The ensemble of seven have a wonderful time portraying these whacky girls. Leading the team of girls is Olivia Macklin as the epitome of mean, Ashleigh. Macklin uses a delightful amount of resistance to portray her power. Her journey of entitlement to loss of power is wonderful to watch, keeping her composure. 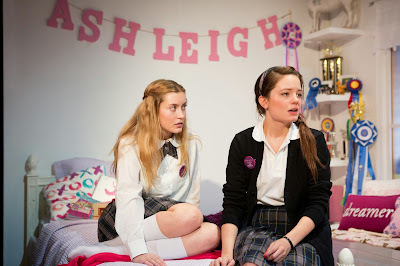 Macklin employs a dry sense of comedy to Ashleigh, something that is drastically different from the more caricature based performance by Kaley Ronayne. Ronayne offers a strong and transformative performance as odd duck Margaret. Ronayne channels her inner kid bringing out the awkwardness of Margaret. Rounding out the strong performances is Angeliea Stark as second in command Tiffany. Stark is well-rounded and sincere. Despite her character having a bit of a radical change after she discovers her best-friend-since-the-womb is about to kick her out, Stark brings out the pain and loyalty of her character. Director Sarah Krohn does a magnificent job getting her ensemble to believably bring their characters to life. She keeps the action moving and allows the beats to be found. Her staging was quite calculated, even keeping a keen eye on minute details including the leveled seating arrangements of the girls. Krohn does struggle finding the cohesiveness of comedic styling among the girls. While they each find their own comedic style that fits their individual character, it occasionally doesn’t mesh as one. Scenic designer Daniel Geggatt does a wonderful job of using the space, incorporating the architecture into his design. The ambiance brings you into the bedroom, allowing you to feel like a fly on the wall. Geggatt too has a nice eye for detail with the pieces and décor in the room. Costume designer Siena Zoe Allen captures the essence and quirks of each of the girls. Horse Girls is a wild comedy with room to expand. And I don't think the audience would complain to see more of these girls. Yet in it’s current state, Horse Girls is an exceptional glance at the mean girl culture and the struggles it brings.